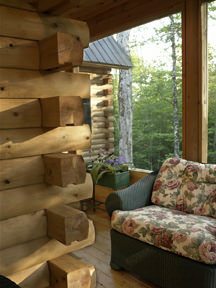 Porches and decks are a great way to include the outdoors in your log home amenities. Many people are maximizing this transitional space with some simple steps. Add warming and cooling effects. 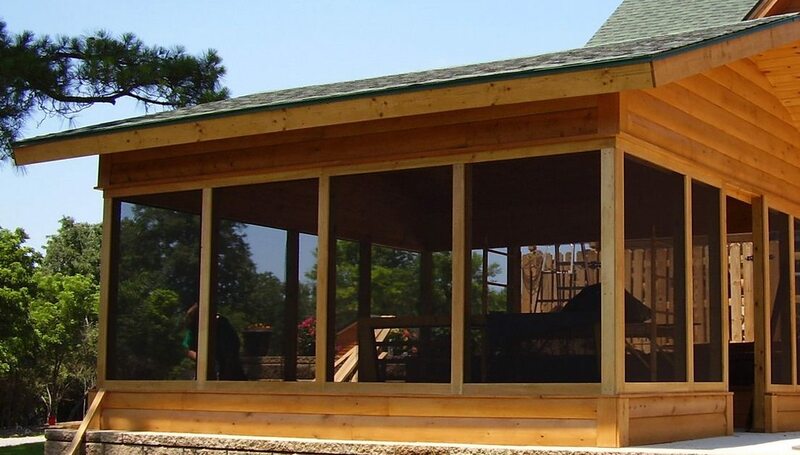 Frame off a portion of the porch area surrounding a secondary entrance and fit the perimeter with screens for summer and glass panels for winter. This unheated space can act as a solar collector on sunny winter days or can allow for cooling summer breezes to provide fresh air. Prepare the decking. Apply wire screening to the deck joists underneath the area to be screened or glassed in to keep insects and critters from infiltrating your three-season area. Apply the screening underneath the decking by stapling it in overlapping layers to the support joists for the deck, or apply to the underside after the deck is completed if the area is easily accessible. Solar orientation. Identify the best location for the three-season area. In colder climates orienting the glassed-in area on the southern side of the home will maximize the solar gain. Adding a three season room on the northern side of the home could enable more windows and light for brighter interiors as well as cooler summer enjoyment. Multiple uses. A three season room can be used for extra entertaining room; as a transition room to keep the outside air (hot or cold) from filtering directly into the home; or a mudroom with extra storage and benches for boots, winter coats, muddy shoes.